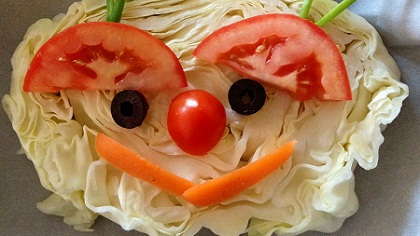 No "clowning around" with this cute and tasty cabbage head that your kids will love to make and eat. Place cabbage steak on parchment paper in shallow pan (such as a round cake pan). Assemble assorted veggies to form a face. Remove tinfoil and continue baking another 15 minutes. Transfer to a plate and sprinkle with Parmesan cheese.